Should you Buy the Note 2 or the S4? So, you’ve decided to sell your Note 2 and get the S4 or can’t decide between the two? Here’s some insights onto why I still use my Note 2 over the S4 and some tips when trying to decide between the two Samsung flagship phones. Typing on the Galaxy Note 2 is just way easier and probably cause less arthritis for those of you getting older like myself. It’s like a difference between sitting on a bar chair or lounge chair all day long. When I type on my Galaxy Note 2 for hours, my hands don’t get tired but on anything smaller such as the S4, my hands start crampin’ up and I just can’t type anymore. Battery life on the Note 2 is EXCELLENT! I can go a full day of browsing the web, watching youtube videos, and listening to Pandora for hours and I will “still have near 50% battery life at the end of the day, usually Note 2 gets me FULL 2 DAYS on light usage and more on some days. Add an external battery charger and batteries, and you can go camping literally for weeks without charging your phone. On the other hand, the Galaxy S4 does come with a bigger battery than Galaxy S3 and sure, it last longer than the S3 but it will never get me over a full day just on battery like the Note 2 can. 3100mAh battery on the Galaxy Note 2 has 600mAh more capacity than the S4 and also 1100mAh more capacity than the S3. The Galaxy S4 does well close to a full day but at the end of the day, if I had to choose one phone (without carrying extra batteries), it would be the Note 2. Screen on the Galaxy S4 is EXCELLENT, it’s full 1080P HD screen with no hint of dithering even when viewing with a magnifying glass. But seriously, if you are viewing the S4 or Note 2 from the normal 12-18 inches away from the phone, you are not going to notice much difference for the most part. The Galaxy S4 looks “just a tad” sharper if anything at all. Also, if you are viewing your phone from longer than 2-3 feet, the Note 2 will actually be easier to see due to it’s bigger screen over the S4. I sometimes watch my Netflix in my car with my phone on my car phone holder and the Note 2 certainly looks better than the S4 without having to hold my phone close. Another point is multi-window capability for multi-tasking, which is available for both Note 2 and S4. The Note 2 was “designed” for this multi-window as it was the first Samsung smartphone to ship with this feature whereas the S4 has it as a software add-on. Even though the 1080P screen on the S4 helps greatly, there’s a huge difference between having more screen real estate vs. resolution. If you enjoy this multi-window feature, definitely, another reason to go with Note 2 over the S4. And what about taking notes or drawing on your phone? Note 2’s S-pen capabilities are certainly nice for jotting notes down during a call, having your kids draw some great art when you run out of paper, and I do personally enjoy writing my own ideas for my YouTube videos such as this one. In this department, Note 2 wins without a doubt with a 1024 pressure-point digital pen, one of the main reasons I bought the Note 2. The Galaxy Note 2 is still well-equipped with a 1.6Ghz Quad-core Exynos processor vs. 1.6Ghz Octa-core or 1.9Ghz Qualcomm on the S4. It’s certainly not fast as the S4 but it certainly has never been slow in running any apps, Note 2 is still really fast and I’ve got my own Note 2 overclocked to 1.8Ghz QUAD-core so I am not complaining. To put it in one sentence, the Note 2 and the S4 are completely different animals just like me and my dog. So should you buy the all-new Galaxy S4 or the Note 2? Well, if you are still undecided about getting the S4 over the Note 2, OR perhaps you are pondering whether you should upgrade from Note 2 to S4, the answer is simple. If you need a large screen for easy typing, using the phone as portable media player, writing/drawing notes with the S-pen, or want to go over full day without CHANGING your battery or carrying extras in your pocket, definitely the Note 2 is the answer. However, if you have small hands or you are used to typing on a smaller screen AND you have to have the lightest/slimmest phone on the market right now with the fastest processor and latest software features like Air Gestures, IR Remote, 1080P screen, dual-camera recording, and more, definitely S4 is your answer. Personally though, I do use my Note 2 as my daily driver because I just don’t feel comfortable typing for long hours on my phone on a screen smaller than 5-inches. Once you go big, you cannot go back. And yes, I prefer big things in life, even my car is big. So in the end, it really boils down to your preference but as a rule of thumb, if you are U.S. adult average height 5’9″ or higher (I am 5’9″), you will feel much comfortable typing on a Note 2 over S4 or any other smaller screen smartphone. And yes, if you already own a Note 2, the chances are that you are still in contract, my best advice would be to save your money for Note 3, which should be coming out in September/October, only couple months away unless you have a money tree growing in your backyard. I prefer my Galaxy Note 2 too..
Yeah, you’re right, I love my note 2 and I’m waiting for the next Note Generation. Would you please send me that wallpaper on your phones in the video? Hi I need your opinion, should I buy the note 2 or the s4 and too u which one is better… Plz contact me back ASAP because my dad is in USA and is buying it for me the note 2 tomorrow and I want to know before he buys it so I can decide!!!!! BTW wats your BIG car??? I am in lov e with my note 2, and looking forward to the note 3. I like the bigger screen, bigger battery, and s-pen. Only thing the s4 has over it is a higher res screen. The cpu/gpu power is so high that most wont notice the difference, even if the s4 edges it out. “I sometimes watch my Netflix in my car with my phone on my car phone holder” Ouch!! I hope nobody at your insurance company has web access. I am in the market for a new phone to replace my HTC Evo from two years ago. The battery dies about two hours after any real use in texting or phone calls. I have played with both the Note II and the S4, and really like the Note II’s capabilities with the pen. However, as a world traveler and photophile, the S4 camera software and abilities are amazing. My question is…will the amazing camera software from the S4 be available on the Note II soon? Nobody? Anybody? I guess I will pursue the s4 since it is unknown if the camer software will come to the note. I am definitely staying with my note2. I have big hands and have bad eyes so the big screen is a winner. I just wish if someone knew for sure if there will be a rom with the new software embedded out soon. I also think I will follow your lead on overclocking my note 2 to 1.8 Ghz Quad. I moved from an iphone 4 to a galaxy s3 and im really happy with the increase in screen size. But after 8 months I feel like having a note. Do u guys think upgrading from the s3 to a note 3 (when its released) is a good idea? Yes, Note 3 would be awesome way to go. I agree with Max! But, make sure that an AMOLED screen with lower pixel density is suited for you. Compared to what you currently have you might find that the low density screen does not give you the sharpness you currently enjoy. I can only assume that Samsung will step it up in regards to the screen in the next model. At the least, I’m keeping my fingers crossed! S4 comes with the latest Jellybean version 4.2, Note 2 does not. Once the next system (Key Lime Pie?) hits, speculation is that the S4 will receive way ahead of Note 2. Maybe the wrong place for this…I was ready to buy the Note 2 due to all the positive press it has received. I was sold on the large screen, but more importantly, the S-pen! Purchased a case and screen protectors in advance so I’d have them on the day I received it. Then I went to the store and was totally unimpressed with the screen! Don’t want to sound like an Apple fanboy, but my 4 year old 3GS has a sharper, brighter screen. I realize smaller screens can naturally be sharper, but my 3GS screen on half brightness is much, much brighter and whiter than the Note 2’s screen. Also, while watching a world rally video simultaneously on both phones, the words on road signs on the Note 2 were blocky and jagged while on the smaller screen they were smooth. I’ve determined that AMOLED is no good, FOR ME. so now its either the LG Optimus G Pro with its IPS LCD 5.5″ screen, or holding out for the Note 3 in hopes Samsung might switch over to LCDs! Some of the articles I’ve been reading are even saying that the newer LCDs are better than AMOLEDs in regards to battery-current draw. Has anyone heard any rumors regarding the screen on the eagerly anticipated Note 3? Dude, remember cargo pants? Yeah, those aren’t going to come back in style for another twenty years. In the meantime, where are you going to keep that big as hell “phone” note 2? I don’t know about you, but I keep my phone (currently Galaxy SII) in my pocket most of the time and real estate in my pants is at a premium — if you know what I mean! I get what you’re saying. The jumbo screen is killer once you get going, and having enough room for a ginormous battery is awesome. But in the 98% of the time when you’re not actively using the device but you’re glad you’ve got communications in your pocket, it’s a lot to haul around. Seriously though, thanks for the review. I had the opportunity to switch out my galaxy note 2 for an s4. I was fortunate enough to have the s4 for a day to compare and see which I prefer. I have come to the conclusion that im going to keep my note 2. The screen size, spen, multiwindow feature while being used with spen and the big screen, along with unbeatable battery life. Are a non negotiable compared to the barely noticable upgrade in screen resolution, barely noticable fasterprocessor, and what not. The only thing I really liked about the s4 was that I could touch all 4 corners of the screen. And with pie controls on my note 2 that solves that problem for me. And I dont plan on wearing girls jeans so my note 2 feels right at home in my normal size jeans and slacks. I should admit that i am impressed with the above conversation and inspired to purchase Note-2 from currently using Iphone. Phew…just saved some money..i am using note2 for sometime and was planning to go for s4..
What if i tell you… the salesman ‘job’ is to clear old model, thus why he pushed on that haha. Also, old model have higher margin of profit due to the sheer number of sales lowering down the cost. No offense I kept my Note 2 too haha but salesman are salesman lol. If Note 3 comes within months they wont able to sell the Note 2 anymore at the same profit margin. actually thats an honest salesman i know my local stores push s4 over note 2…. well just my two cents. I have the Note 2 and couldn’t go back to a smaller screen. The benefits off a stylus and long battery life far out way some of the features on the S4 that I would not ever use, or find annoying. Apps like S Translator can be installed on a rooted Note 2, and Polaris Office can be installed on a non rooted phone. So I can’t see the benefit. The S5 will come out in a few months no doubt….when does it end? I had Note 2. Later i got s4. But to be honest s4 could not satisfy me. so i sold s4 and got back note. Well we have an opinion here that you can not imagine what a remarkable device they have made this note 2. Its perfect from any angle. I’m going to be a minority vote here because I was using the Note 2 for the past month on a “trial” and I decided to switch to the S4 and couldn’t be happier even though I miss things about the N2 (all the good stuff you all have cited). The device size is a tough one for me because I too like large utility space of all kinds and enjoyed the large screen for reading (biggest downside of the S4 for me: it’s really not a substitute e-reader where the N2 just barely made it into that category) but it’s pretty cool having all the power and features that were unique to the Note 2 in a smaller, lighter package. I also find the S4 to be noticeably faster at just opening apps, changing apps, even the wifi is a good 25% faster on downloads, as measured by Speedtest.net. (I don’t do anything with my phone that would yield noticeably faster processing even if the benchies show it.) But where the Note 2 seemed a bit “lumbering” at times the S4 is more sports car-like in its responses, or at least it feels that way. In the end, I think it is the fact that I did not use the S pen as much as I expected I would that enabled me to part with the Note. I’m too used to 12.1″ tablet PCs like the Thinkpad X230T to find writing on a 5.5″ screen comfortable; on the Note is was more of a convenience and a cool thing, less a productivity enhancer for me, though I can see how it could be if you adapted your workstyle to it. Anyway, thanks for the great review and great comments. I’ve never spent time here but plan to in the future. And let’s face it: by Christmas I’ll probably have switched to the Note 3!! I am in confused please suggest me . Which phone should i go for Galaxy Note II or Galaxy S4 ? I bought both, both on their respective release dates. I agree, the note is by far more of a multi use device while the S4 is more of a gimmick. I use the S4 as of now because it is more pocket-able and I really love the IR blaster (even though I don’t use it much). The air gestures are a joke on the S4, the eye tracking is really only head tracking, it measures your head tilt from when your at top of page to bottom using your eyes as a reference point. I bought all the toys for the S4 so I have the battery charger with a total of 4 batteries. I go through 2 to 3 a day because of heavy use. the other thing I love is the flip case that has the window… with that said I took it off and it’s back in the box in a closet. I miss the Note 2… So in short I’ve now had it and I’m ready for the note 3 to release. I am selling the S4 with all the goodies to the next happy owner and going back to my non glitchy fast battery conservative s pen lovin note 2. Are there any news about the 4.2.2 update on GN2? I’m having a hard time decideing wheather to wait the update or to root now.. If I root on stock, would I be still able to update to 4.2.2 on stock? see guys. forget all about these phones. Just rely on oldest tring tring on you office table. your life will become beautiful once again. I have an old odd broken 3GS and was sure that o needed a note 2. But i just bought a Note 8 that comes with a S pen and indecision clouded my vision again! Since i pretend to carry my tablet with me and use it to write and media, should i go with a S4 instead? One of the specs that attracted me to note 2 was the battery. Is it a major dif between s4? Well I still use Note 2 more because of battery and screen size but it’s really up to you. S4 has some great custom rom and development maybe better than Note 2. I currently own the Galaxy Note 2 and I love it. Thanks for the great article! Bought the Note 2 over S4. Love the bigger screen and the s pen features! Multi view just works better on the larger screen. Watching vidoes look fantastic. The phone is super quick. It truly is a multi media/multi tasking powerhouse. With the next android update 4.2.2 coming in the fall some time, it’ll have pretty close to all the features of the S4 and more. You won’t go wrong in buying this awesome phone! I’ll never go back to a small screen phone again. Good read! I’ve had the note 2 and loved it. But I couldnt resist the S4 “I love the camera and 1080p screen” and sold my n2. I’m waiting on the Note 3 and may very well take the plunge once again. No money tree but I have to do something about that huge Vortex in my back yard! I bought my Note 2 outright as I would have an S3 but I know how my mind works, and I would have always been think of the Note 2, and should I have bought it instead. Well, I bought the Note 2 and never looked back. Current rooted with stock ROM and using the Perseus Kernel. I also bought the paid versions of ES File explorer / Task Manager, ROM Manager, Mobile Odin, Titanium Backup, also SuperSU and Triangle Away. STweaks that came with the kernel is fantastic. I eliminated a lot of junk that came with the phone… for instance, everything that said Yahoo! on it. I’m not a gamer, so I’ve never had any problem with anything lagging… just instantaneously fast… and I actually underclocked the Note to 1,500 and did a bit of undervolting. Not much but now I even get more batt life! Not particularly intent on a Note 3, but will probably wait for the Note 4 (lol) since I only bought this phone in Feb. I also looked at the Optimus G Pro… but I have a Samsung fridge, washer and dryer, and TV. LOL. I also discovered Max’s site before buying, and that put me over the top as far as what to buy… at least the brand-wise. Love this device, and it gets a lot of attention when I pull it out and take a call or take a note. Many thanks for that Good Contest. Would enjoy to win!! Quite annoying seeing these reviews and comments about how “the note 2 is so much better and always will be!1!” I have a note 2 and I can tell you right now, aside from the bigger screen, the s4 is much better in every other aspect. If you’re a taking notes kind of guy, go for the note 2. But the s4 is newer, which means higher specs. S4 wins in my opinion. Next story HTC One Unboxing! 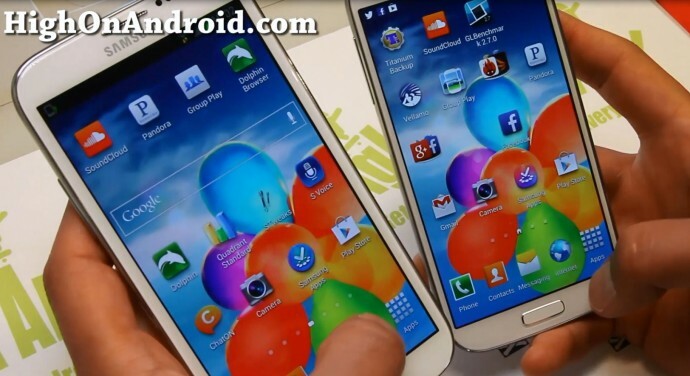 Previous story Galaxy S4 vs. Galaxy S3 Comparison!